The Biblical World: The Theology of Gilligan's Island: Who'd of thought it? Another happy childhood memory dashed on the rocks!!! Actually, other than the creator and producers wanted to make a wad of money off a weekly series portraying seven castaways, there are several alternative interpretations of the show. 1) Gilligan's Island was all Gilligan's dreamscape. The ship with its two crew members and five passengers set sail that day but came back to port. The subsequent episodes are Gilligan's dreams regarding his own desire to address his inadequacies. He wished he was smart as the professor. He wished he had wealth like the Howells. He desired to be a competent, blue collar businessman like ... his Skipper. He wished he had the perpetual company of the girl-next-door or a successful actress. 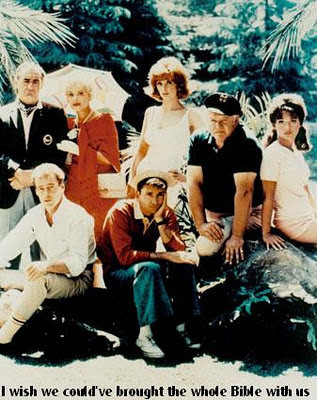 2) Gilligan's Island was Hades/Purgatory. In the show the actual dispensation of all seven souls was they perished during that storm. They all awake in a nether world where despite their different personalities and stations in life they actually live a successful existence in their new afterlife together. They always seem to have plenty of food, they have adequate shelter, they are amused by one another and the ever creative inventions of the professor, they are never bored with one another and they are rarely ill despite being bereft of modern medical technology. Money means absolutely nothing in their quasi-utopia and thus they do achieve a very real measure of social comity and satisfying unity despite their differences.